Picture me in my recliner! I'm in my recliner! After market, I just had to take some time off. I've been reading books, going out to lunch with friends, playing the piano, watching my nails grow. 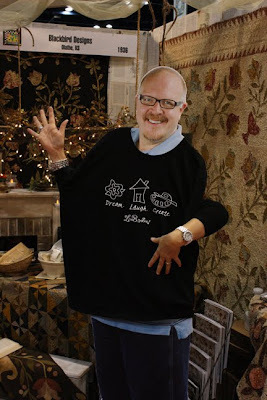 taking cooking classes and in general just acting like I don't have to get the house ready for the holidays. (And believe me I've got plenty of work to do....but it's hard for me to get interested in a vacuum, dust rag or even a dish washer.) Are you feeling the same? I think if anyone can get me out of a chair to make them peanut butter and toast they would be lucky! La de da ....right? Dave was hopeful there might be dinner after my great cooking class. But I think the class was more about watching someone cook a meal for me....not about me cooking. I finally had the energy to get out my camera and check the pictures I took at market. And I knew I had to get on-line and share some fun ones with you. 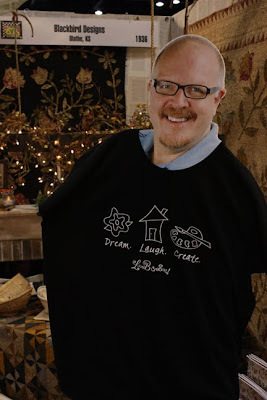 I know you've already seen just about everything there is to show from all the real bloggers....but just in case you missed something, here goes! Guess who dropped by our booth at market? Mark Lipinski! He's a favorite of ours. His sense of humor is really over the top. I love him even though he had the audacity to call me and tell me he was going to fly me to New York City for a make-over. I was so excited! (I could really use a make-over too.) Then, he casually asked,"How old are you?" Right then I should have known trouble was brewing! I replied, "55." He said, "Nevermind, you're too damn old. I need someone younger. Do you know anyone else I can call?" Building a booth can be hard work. I built two stud walls and added 4 - 4' x 8' panels of homasote to cover the stud walls. The homasote panels are covered with pages from old books. Dave got involved and built a couple of ladders. One for the top that held the second ladder in place. 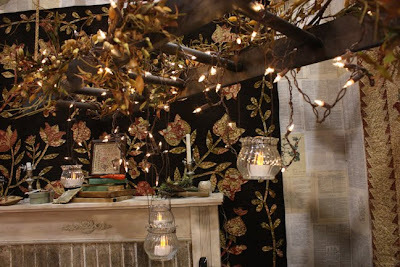 A bit of garland, some twinkle lights and hanging candles and you get the idea! The table was covered with a quilt of Barb's. 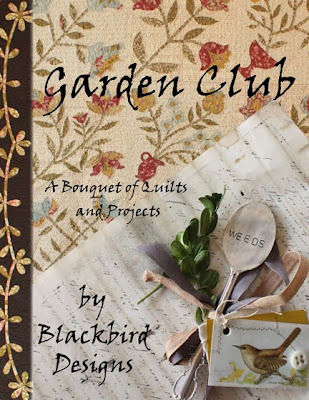 All of the projects in the booth are in our newest book Garden Club. The two featured quilts hanging on our back walls are done with our fabric line "Wild Rose" (Moda fabrics of course!) The only exception is Barb's dark background. It is a brown/black woven check....which is not in this fabric line. "Wild Rose" is shipping to your local quilt shop this month. Just in time for you to make one of these quilts. Barb made this sweet basket pattern from the fabric line shown at quilt market. It's "Antique Fair" and will be released to shops next spring along with the pattern. 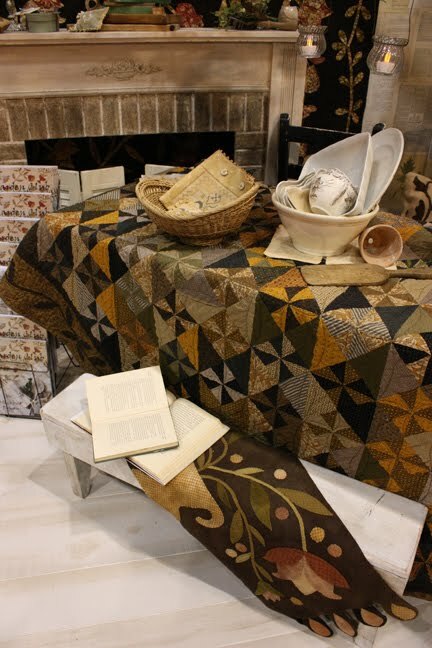 Lissa from Moda fabrics sent me some pre-cuts of our fabric line "Antique Fair." Look for a contest soon! Until later dear friends. I promise to get out of the recliner soon. Congrats on the "best single booth"...everything looked wonderful! Sounds like you need more time in that recliner...enjoy. The booth looks wonderful...you earned some recliner time! 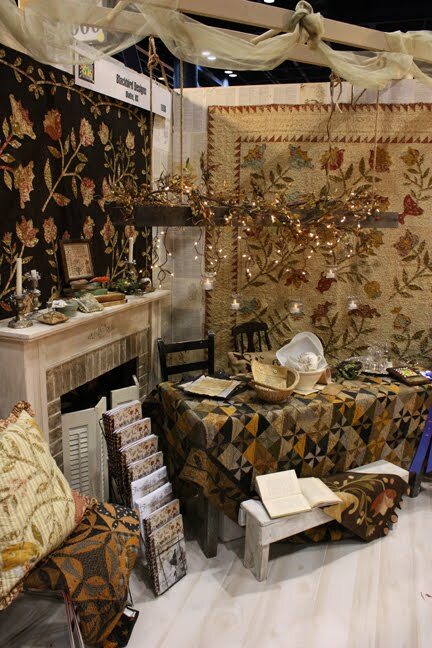 Positively Beautiful booth, I love the suttle colors and the way everything is laid out. Enjoy that recliner, snows a coming, a recliner is the best place to be with needle in hand. Alma, Congratulations on the ribbon! The booth looked fantastic and I am so anxious for my lqs to get the book in. I want to do everything that I see already. My lqs also said they have order all of your new fabic line, so I'm anxious for them to receive that too. I loved your photos of your booth in Houston! I should say that you need to take time off and recline a bit. I love meeting you and Barb! Go and watch my blog what I and Supergoof did on market too. I'm so glad you are back. I really missed your blog. Your booth looks beautiful. Hope you are rested up. Congratulations on winning the best booth! I KNOW how much work trade shows are. Really, really loved the ladder with garland and lights. Too much creativity happens at your house - which benefits all of us. Can't wait for your book to arrive - I ordered it today. Congratulations on the best booth ribbon. You guys deserve it:) Hope you are having a restful time in your recliner--enjoy. Waiting to hear from you on some more stitching projects. You deserve a vacation! Not a busy vacation, a relaxing vacation!! Love the both photos and the projects I see! Love that pillow with Barb's initials!! Can't wait for the book to arrive. Wow! Wow! and WOW!! Your booth was incredible...no wonder you need a recliner!! And believe me- you deserved the biggest blue ribbon there!! Stunning...and YES the ladder certainly helped!! :o) Take care! I don't blame you, I can imagine how much work went into your booth, then the market, then taking it all down, makes me tired thinking about it, lol. Your booth definitely deserved a ribbon, you did such a beautiful job on the decorations and set up. Your booth was beautiful, as usual(I've never seen them in person, so am always so thankful when generous people take time to share with us)! I had the great pleasure of meeting you & Barb @ Prims of the Midwest. You both are so warm, fun & super-talented. Even though you were trying to make me feel better by telling me you have alot of people to help you get all of your projects done, I just have to say I continue to be amazed @ your creativity! Thanks for all you do & share with us. I'm getting all of my G'kids large photo albums for Christmas this year, to start their artwork collections in, thanks for sharing that with me! I always enjoy seeing the photos of your booth. It gets better every year. Will look forward to your new book. Congrats on winning that lovely blue ribbon..Glad to have you back and posting! Can wait to get my hands on your new book and fabric. Love the booth. Alma, I know how you feel. After 8years of taking care of my elderly parents (Mom had a stroke last year and they are going into the retirement home at the end of the month), no one will be able to get me to do anything for anyone for quite a while. Maybe I'll get a rocking chair and rest for a while :). Well when I am not having fun stitching and quilting and playing. Playing? What's that? I'll have to get reaquainted with playing. You and Barb have been busy girls. Put those feet up, Alma. You deserve it! Love your new quilt designs! 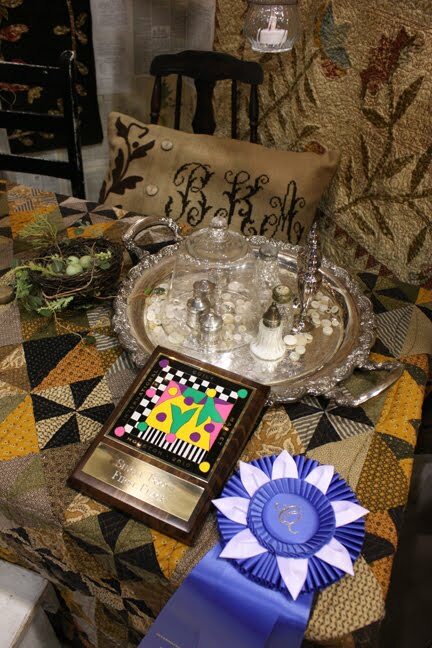 Your booth looks fabulous , many of us and me would love to see your booth at The Quilt Festival in Birmingham (UK) next August!! There would be a riot LOL. Your book is wonderful and a must for quilters & stitcher's alike!! 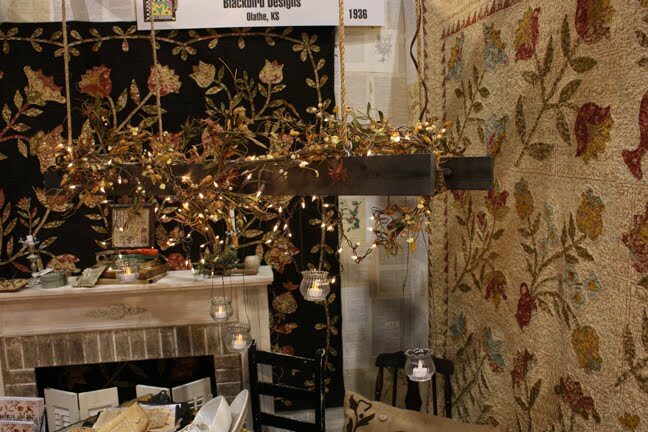 another beautiful booth from the blackbird ladies. Sit awhile and soak up the accolades. stay in that recliner and gather your energy - this is the lull before the holiday storm! Congratulations on your blue ribbon at market! Just love your stuff! I'm not a bit surprised you won a ribbon for your booth! It looks like it was WONDERFUL! Alma, I think you and Barb both deserve some rest and personal time :-). I so enjoyed getting to take two classes with you this year but I know what a crazy schedule the two of you have had this year. Love all the pictures of Quilt Market!!!! Glad you are resting. It was a lovely booth. Congratulations on your booth - looked beautiful from the photos! I did find some Wildrose in layer cakes & charms the other day, the line had not arrived yet, cant wait to get yardage & the book. Is the basket quilt made from yet another line? Take good care of yourself, so good to have you post again!! Hugs!! Just gorgeous! LOVE the new book! You ladies keep getting better! Those quilts look gorgeous - best yet! The book is on my Christmas list and my sister has promised to buy it as soon as it arrives in the UK. Enjoy as much recliner time as you need - coming up with these wonderful ideas must be exhausting. That poster/cutout of Mark freaked me out at market the first time I walked by....I actually had to do a double take and make sure it wasn't him just standing there watching people go by....it would be like him to stand there so still and scare you as you walked on by. LOVED your booth. Love your new book! Congrats on your ribbon! Your booth looks wonderful and I enjoyed seeing your Moda video about your booth. I loved your booth at Market. It was nice to meet you. I was there with my Woolen Willow sisters. Congrats on your booth and ribbon. Love you new book. Received book yesterday and ordered fabric today for Pressed Flowers. Just need to find dark brown background fabric for background. Any suggestions?? Rest while you can because Christmas is just around the corner!!! you have a GREAT sense of style.. and HUMOR! That man needs a makeover! Congratulations on your booth prize. It was well deserved for a beautiful booth. The new quilts are wonderful. I have a copy of Garden Club and love everything in it. 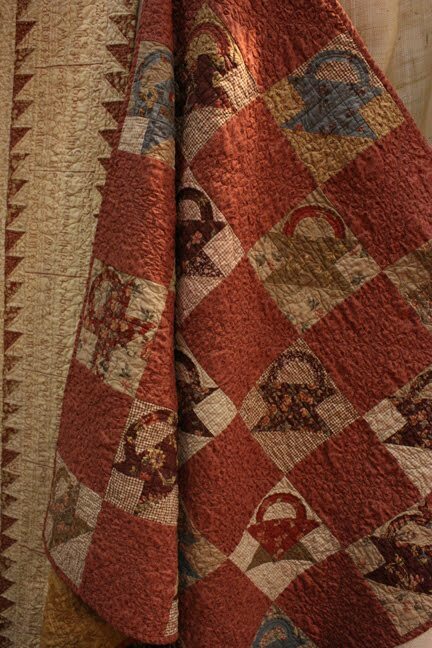 Wish everything was mine in that booth of yours.. it is all the most wonderful quilts and things!! Congratulations and well done!! Alma, your booth was absolutely stunning - you deserved the ribbon and you also deserve to retire to your recliner for as long as you want!!! Can't wait to enter your upcoming giveaway - maybe I will win it this time! Drop by and enter mine that's at http://www.funkybabymine.blogspot.com for the rest of November. Your booth looks wonderful. I enjoyed watching the video. The jute pillow with the cross stitch monogram and wool applique are in the book GARDEN CLUB. Your booth turned out beautifully! Congratulations on the blue ribbon. OK Alma, enough is enough. Out of the recliner already. How am I to be reassured that you are sharing in my holiday menu angst if you say nary a word? Out of the chair and back into the mayhem that makes our lives so wonderfully worth living. Help! I have been searching and searching for a picture I saw of a lighthouse stitched in blue. My memory, as untrustworthy as it seems, believes that it was from one of your classes. If you, or anyone out there, has information - I would love help! Thank you and congrats on the ribbon! Hello..... just found your blog and love it.... also love your books and have actually made the Quilting the Garden quilt which won me Best in Show and Best Hand Applique Ribbons in our local show here in New Brunswick, Canada. That was in 2008. I would post a picture if I knew how ! I am looking forward to getting your latest book. Keep up the good work!! I agree with Ruebarb! Time to get out of the recliner and let us know what you've been doing. Love the quilt that Barb made with the new line of fabric. It looks so vintage. I'm looking forward to seeing the new line at the quilt shop. I just know you didn't get to sit in that recliner through Thanksgiving! But we didn't hear about any recipe searches or cookie bake-offs! help, we are going through withdrawals.....we NEED to know what you are up to. What is that saying, "Help, I have fallen and I can't get up?" I am hoping you have gotten some rest and ready for the holidays. I do miss your post, and looking forward to another one soon. I just ended a small project and I am going to start garden fair ,and as you may know now I am a total fan! !My home sweet home ,when I show it ,people say wauh,hohoho and I decided to do one of your minimum each year as main project.Ialso love mark , he is a funny guy ! whera are his dogs ? ?and I would love to give you some way to cook good and quickly and not long ,hard to do!! yes yes it is possible even in FRance !! friends are welcome at my blog bergamottepatch.over-blog.com,your frirnds are mine ! love !! Most of the stems are 1/2" wide. There are a couple that are 1/4" wide. This is a terrific book - I bought it over the week-end at the local Quilt Gathering. Enjoyed the mix of quilts, sampler, roll for pins (etc). Thank you for sharing this post, After reading this post people can think about design of living room and dinning room. Keep giving updates.